I´m an English teacher working in Santiago de Compostela. I teach intermediate and advanced level students. 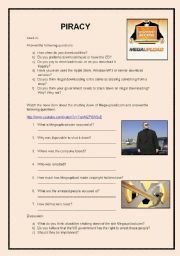 Listening activity on news about the shutting down of the webpage megaupload. Link and key provided. 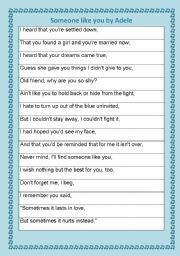 SS must listen to the song a put the lines into the correct order. Quite challenging. They may need to listen several times. Hope you like it. 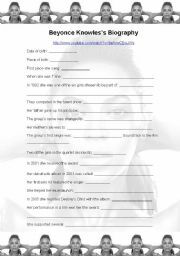 Worksheet on the life and music career of Beyonce Knowles. The Tube link where you can dowload the video is http://www.youtube.com/watch?v=9aAnwCEwJWs . Students listen and watch and fill in the gaps. More suitable for upper-intermediate students. Hope you like it! 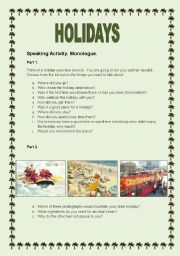 Speaking monologue activity where students talk about a past holiday experience and discuss about what their ideal break would be like. 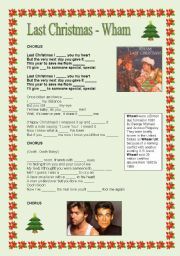 Very popular Christmas song that students of all ages will surely enjoy. SS must fill in the gaps. Key provided. 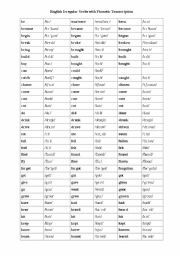 List of irregular verbs with phonetic transcription. Students find it really useful to be able to learn the irregular verbs with the correct pronunciation. Listening activity with link included (18:55 mins). Students learn about Guy Fawkes, the Gunpowder Plot and Bonfire Night. They are asked to put in order the different events in the story. Key and brief history summary included. Good to use around 5th November. Hope you like it! 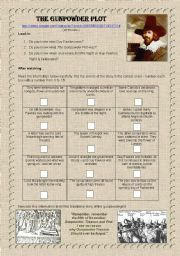 A listening worksheet for a podcast taken from the page Podcastsinenglish.com 5 people comment about their favourite movies. Link included. Exercise for the Bonnie Tyler song Holding out for a hero. Students listen and try the spot the extra words. Link to you tube video of the film Footloose is included. This is a power-point activity with 8 questions about London´s most famous tourist sights. Looks simple but students find it challenging.